NOTE: For additional torque specifications, refer to SENR3130, Torque Specifications, available from your Caterpillar dealer. 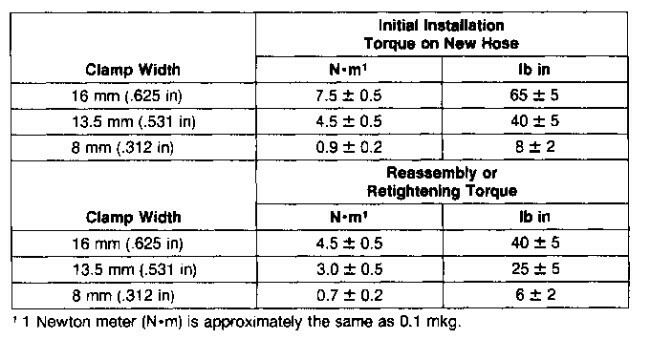 The following chart lists the torque values for initial installation of worm drive band type hose clamps on new hose and for reassembly or tightening of hose clamps on existing hose. The constant hose torque clamp is installed properly when screw tip (1) extends 6.35 mm (.250 in) (dimension X) beyond the housing and the belleville washer stacks are collapsed nearly flat after screw (2) is tightened to a torque of 11 ± 1 N·m (98 ± 9 lb in).